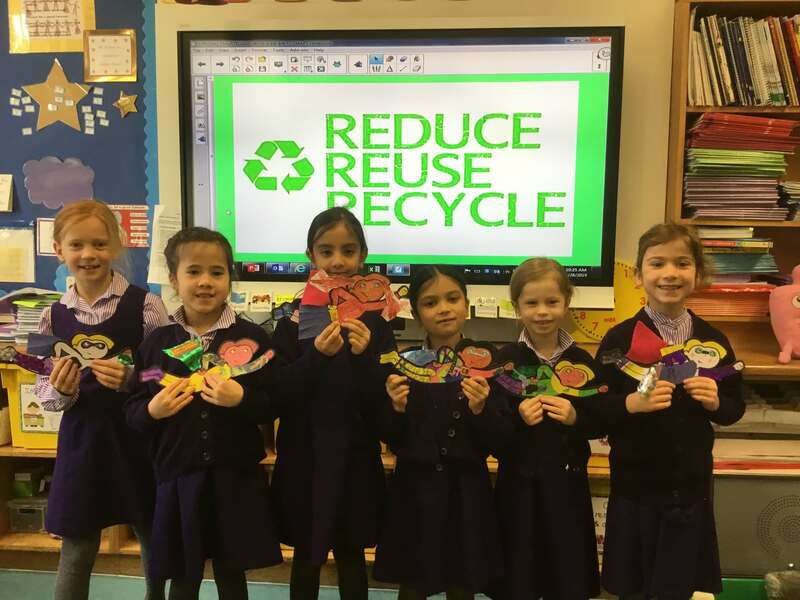 This week all Glendower girls enjoyed a recycling workshop – the lower school girls made recycling superheroes, the Year 4s enjoyed their food waste bingo workshop and the Year 5s and 6s explored issues around our ‘plastic planet’ and then designed posters to highlight the plastic problem. A lot of knowledge was gained around recycling and fun had too! Let’s remember what we learned last week, Glendower and continue to reduce, reuse and recycle! On Monday a special visitor came to our assembly. His name was John and he was part of the WRWA (Western Riverside Waste Authority). He told us about how people are trying to come up with ways to help the planet. For example, he told us about the three R’s -Reduce, Reuse, Recycle. He also said that one huge building in London, The Shard, is made out of metal cans and all kinds of glass! He also talked about how people are polluting the planet and how waste gets thrown from the sea onto land. He also said that one third of the food we buy in England gets thrown away! At the end, he said that if we all help a tiny bit, these tiny bits add up and can make a gigantic, positive difference for our planet and us. I really liked the assembly and hope that everyone tries to help. We read a story called ‘Michael Recycle’ and we made our own Recycling superheroes! We reused materials to decorate our own superhero costumes. We thought about our superhero powers and how to reduce, re-use and recycle. My superhero was called ‘Riri the Recycler’ and her special powers were to reduce, re-use and recycle. We had lots of fun! The recycling workshop was really good. It taught us how to make a difference in this catastrophic situation of climate change caused by global warming. We learned 3 really useful words – reduce, reuse and recycle. The workshop leader showed us where our plastic goes and the damage it causes to the marine life. It was really sad to see. We saw birds who had eaten plastic and we learned about plugging. It means to collect plastic rubbish when you are on your run or going for a walk in the beach. We want to encourage everyone to recycle and to use reusable bottles.